Step 1 Combine the strawberries, amaretto, sugar and tarragon in a bowl. Cover and refrigerate 2 hours, stirring every 30 minutes. Step 2 Heat the oven to 500 degrees. Remove the strawberries from the refrigerator and arrange them in 4 creme brulee dishes, packed tightly together with the flat ends of the strawberries facing down. Put the dishes on a baking sheet and place them on an oven rack directly under the broiler, about 10 inches from the heating element. Broil until juicy and just browning on top, about 3 to 5 minutes. 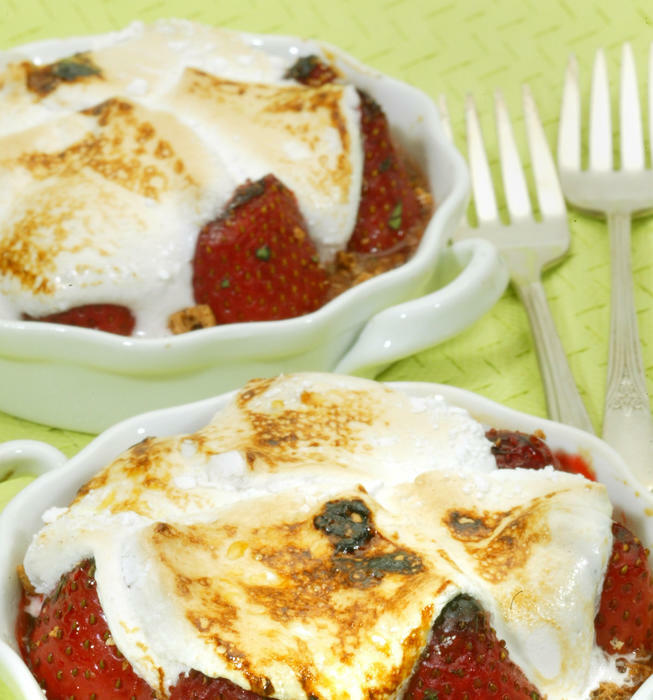 Step 3Remove the strawberries from the oven, sprinkle each dish with 2 tablespoons crushed amaretto cookies and arrange the marshmallow slices on top of the strawberries, slightly overlapping in the center. Step 4Return the dishes to the oven and broil to toast the tops of the marshmallows, 10 to 60 seconds, taking care not to burn. Remove the desserts from the oven and serve immediately. In Recipes-list.com we have selected the most viewed recipes from category - Desserts . Enjoy the best recipes specially selected for you! Strawberry marshmallow brulee is the right choice that will satisfy all your claims.